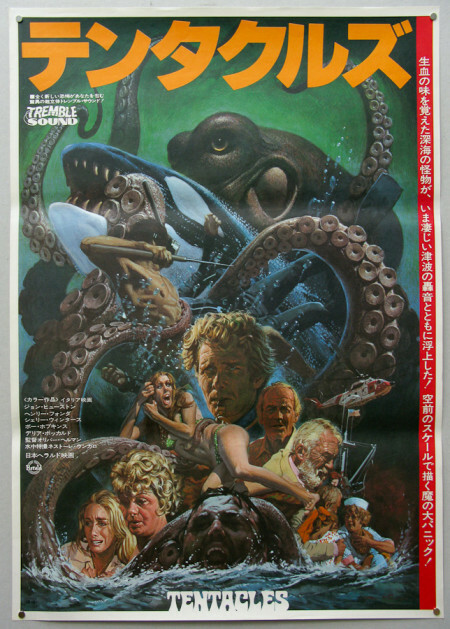 What it’s all about: Tentacles (1977) may begin with the most boring opening credits sequence ever (a prolonged close-up of a taxi cab dispatch radio does not make for scintillating cinema) but things quickly get underway as a mysterious underwater presence stalks a mother and child. Mysterious might be a bit of an overstatement. The movie is called Tentacles after all. We know exactly what’s going to happen next. While the mother is momentarily distracted chatting with a friend, the baby is snatched from the shoreline. A peg-legged sailor quickly becomes victim number two. After spending the night researching possible causes for the recent “accidents”, Ned is joined by his sister Tille, played by Shelly Winters. If Huston and Winters as cinema’s most unlikely siblings weren’t already crazy enough, there’s the fact that Huston plays the entire scene in a laughable floor-length sleeping gown while Winters crows about her most recent (and unlikely) romantic conquest. To top it all off, we’re told that Winters’ character has a pre-teen son. Henry Fonda plays Mr. Whitehead, head of Trojan Construction, the company that’s spearheading a massive underwater tunnel project. Whitehead chews out lackey Cesare Danova when it’s implicated that Trojan was somehow responsible for the recent deaths. Tentacles came along during the ‘take the money and run’ phase of Fonda’s illustrious career. It seems that Fonda would appear in just about anything as long as he was paid well and his scenes could be shot in a day or two. Some of Fonda’s other notable ‘paycheck’ roles include, Rollercoaster (1977), The Swarm (1978), City on Fire (1979) and Meteor (1979). Two divers are sent to the sea floor in a diving bell to examine the Trojan work site. They stumble upon the lair of the giant octopus. One of the men is quickly dispatched in a cloud of black ink. The other tries to escape to the surface in the diving bell, but a reinforced steel compartment is no match for an enraged cephalopod. Good ole boy marine expert Will Gleason and his wife Vicky (Bo Hopkins and Delia Boccardo) arrive in town to help with the police investigation. Vicky worries that Will’s latest assignment is too dangerous. Will insists that a man’s gotta do, what a man’s gotta do. Vicky’s sister goes boating with some friends. They unknowingly lay anchor near the octopus’ underwater lair. With a few false scares to take up some screen time, Judy’s two friends become appetizers and, after the boat is ripped apart, she becomes the main course. When her sister doesn’t return from her trip, Vicky charters a boat and goes out looking for her. They quickly find what’s left of the boat, but none of its passengers. They leave a bouy to mark the location and head back to shore. Suddenly, something massive rises out of the water and engulfs their vessel. Vicky is tossed into the dark waters and can only watch as a giant tentacle drags the boat beneath the waves. She swims back to the buoy, but is caught in the eight-armed embrace of the giant beast. Will waits and watches the solemn parade of ships returning to port. His wife’s boat isn’t among them. “Will, it’s gotta be destroyed, that thing. Can you do it?” Yes, he can. But his plan is so cockamamie that he leaves the room without telling anyone what it is. A chintzy local parade kicks off the Jr. yacht race. With up tempo muzak blaring on the soundtrack, the kids ready themselves for the regatta. A comedian dressed as Uncle Sam entertains the crowd once the race has started. In a weirdly edited montage, shots of the adults, the kids and the oncoming octopus are all intercut while we’re forced to listen to the comedian’s painfully unfunny shtick. Tille, resplendent in a striped sailor ensemble, remains on dry land and communicates with the boys via walkie talkie. She listens helplessly as the octopus attacks. Soon, there’s nothing left but an ocean filled with overturned boats. Did the octopus eat ALL those kids? Unfortunately, no. The Coast Guard picked them all up. The giant barge they’ve towed with them to the cove contains a pair of killer whales from the theme park where Will works. Will’s great scheme is to set the whales free and have them battle the octopus. While perched atop the barge, feeding them fish through a mail slot, Hopkins talks to the whales he’s named Summer and Winter. It’s a wonderful moment to be savored, truly one of the most absurd monologues in B-movie history. Please note: The copious use of ellipses in the following paragraph is an attempt to approximate Hopkins’ curiously pause-filled line delivery. Whether this was a conscious acting choice, poor memorization or lousy ad-libbing is anyone’s guess. The next day, a mighty force rocks the boat. Will and his brother race topside to find the barge destroyed and the whales swimming away. So much for that idea. On to plan B. That is, if there is another plan. The boys dive into the water, but since they have no weapons or explosives, it’s impossible to tell what they’re going to do. While exploring the entrance of the octopus’ cave, a shower of coral and boulders comes raining down on Will, trapping him. As the octopus moves in for the kill, Summer and Winter come charging to the rescue. Will’s brother frees him as the killer whales tear into the octopus’ spongy flesh. The octopus retreats into its cave, but the whales are unrelenting, ripping the creature to shreds. What’s left of the monster sinks lifelessly to the ocean floor. Will and his brother sail off into the sunset with their whale friends accompanying them. 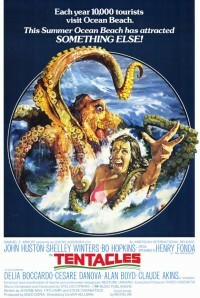 In conclusion: Tentacles is a flawed, but respectable entry in the “Monsters on the Loose” genre that flooded movie screens in the wake of the blockbuster Jaws (1975). One of the main complaints against Tentacles is that it’s dull and there aren’t enough octopus attacks. While the attack scenes are sparse and nearly bloodless (which is weird considering that this is an Italian genre picture) there is still plently to keep bad movie fans entertained. The main point of interest being the curiously A-list cast spouting absurd dialog and acting out ridiculous scenarios that are meant to give their characters “depth”. Schadenfraude thy name is Tentacles. Tentacles is available on both DVD and Blu-ray. It was released on DVD through the MGM Midnight Movies label and is currently out of print (though still widely available). The double feature “flipper” disc also contains the Joan Collins/Bert I. Gordon Drive-In epic Empire of the Ants (1977). Both films feature several language and subtitle options and are supplemented with their original trailers. Both films looks terrific (as with most Midnight Movie titles) and are presented in their original widescreen formats (Tentacles 2.35:1, Empire of the Ants 1.85:1). Tentacles made its Blu-ray debut in 2015. The quality is nearly identical the previous DVD release, only it has now been paired with the Danish monster-on-the-loose epic Reptilicus (1962). Trailers for both films are the only bonus features worth noting on the HD release.